Citation Information: J Clin Invest. 2007;117(4):873-876. https://doi.org/10.1172/JCI31856. (A) Classic RAS. Angiotensinogen is excreted from the liver and converted to angiotensin II through sequential cleavage by the enzymes renin and angiotensin-converting enzyme (ACE). Circulating angiotensin II activates AT1 receptors in numerous target tissues, resulting in responses such as increased water and sodium reabsorption, cell proliferation, and changes in vascular tone. In this system, renin synthesis and excretion by the kidney determine the levels of circulating angiotensin II and therefore its downstream effects. (B) Brain RAS. 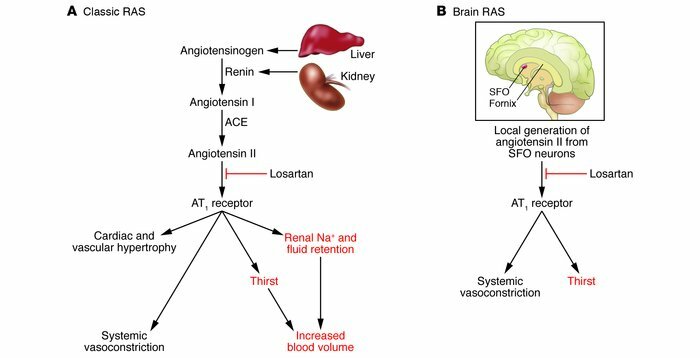 In this issue of the JCI, Sakai and colleagues (4) demonstrate that production of angiotensin II in the SFO from locally derived angiotensinogen and renin has profound effects on thirst and salt appetite. If local synthesis of renin is controlled independently of kidney-derived renin, this would allow for distinct regulation of the physiological responses to angiotensin II within the brain.